For some parents, getting a 14-month old to fall asleep and stay asleep is a nightly battle. As toddlers grow, they would rather engage with the world around them than go to bed at night. Toddlers may also begin having fears or separation anxiety that make it difficult to go to sleep. Ensuring that your toddler gets enough sleep will help keep her healthy and happy. You can make a few changes to the bedtime routine to help your 14-month-old fall asleep quickly and stay asleep all night. Create a bedtime routine. Elizabeth Pantley, author of "The No-Cry Sleep Solution for Toddlers and Preschoolers: Gentle Ways to Stop Bedtime Battles and Improve Your Child's Sleep," writes that doing the same things at the same times each night will work to ease your toddler into going to bed. You can choose what activities you want to include at bedtime, such as a warm bath, a story and a song. Do these activities in the same order each night and your toddler will begin transitioning to sleep mode because he knows what to expect next. Provide comfort when your 14-month-old has a hard time falling asleep. Your job as a parent is to offer reassurance and support when your toddler is unsure of what is happening. KidsHealth reports that it's important to help your child feel safe in her bed, but to avoid giving into each complaint because she will quickly learn that she can get you to return to her room whenever she wants you. If your toddler is fussing or crying, return to her room, reassure her quickly and then leave. If your visits become entertaining, chances are your toddler will keep calling for you. Make your toddler's bed and bedroom warm, inviting and comfortable. Pantley recommends creating a cozy sleeping environment to help encourage your toddler to enjoy getting into his bed and sleeping in his own bedroom. If using a pillow and blankets, remember safety, writes Pantley. Flat toddler pillows and thin blankets are safe choices that will also provide comfort. 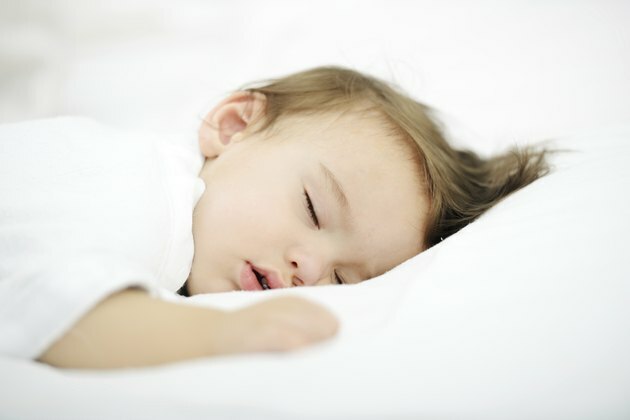 Check the temperature in your toddler's room to make sure it is not too hot or too cold for comfortable sleep. A fan or white noise machine can block out sounds from the rest of the house that make it hard to fall asleep, and a night light can help ease fears of the dark. Ensure that your toddler gets enough sleep during the day. Children who are overtired often have a difficult time falling asleep. Make sure the naps are at the same times each day to promote restful sleep, says Pantley. Most 14-month-olds will still take at least one nap during the day and putting your child down on time each day will help ensure that she is happy during the day and will help prevent her from becoming overtired so she does not want to go to bed at night. KidsHealth adds that experimenting with timing and length of naps may take several weeks to find the best combination for your child. Make sure your spouse and others who care for your children know the sleep routine so your child is still able to go to sleep when you are not there. If your toddler tries to crawl out of the crib, try lowering the mattress to prevent her from falling out.